Click on Mode for your choice of 3D modes or choose Left or Right for 2D viewing. While the luxury car makers all aspire to have a world class flagship sedan, the real action is one market segment down from the pinnacle, where the BMW 5 Series reigns. Audi unveiled the latest generation of its not-quite-uber sedan, the A6, at the Detroit show. While the exterior design is evolutionary and continues Audi’s philosophy of maintaining a uniform brand identity, so it doesn’t appear to depart that far from its predecessor, those subtle changes belie significant changes beneath the car’s skin. There’s an all new aluminum/steel composite frame that is as at least as stiff as the previous A6 but weighs 15% less than if made completely from steel. The finished product, when spec’d with the 2L diesel, weighs a hair under 3500 lbs. The A6 will have 3 diesel and 3 petrol engines available ranging from 177 to 300 HP. Audi also introduced the A6 Hybrid though since the introduction there’s been some word that it might be a bit of vaporware since it won’t see the light of day for at least a couple of years. The hybrid A6 is FWD only, comes with a 2L TFSI 4 cyl engine, a 45 HP electric motor and an 8 speed Tiptronic transmission. It has a relatively small li-ion battery pack rated at 1.3kw/hr. Audi estimates a combined 38mpg. Though Audi, apparently standing on its sporting credentials, touted the A6 Hybrid’s ability to get up to 62mph on electrons alone, the car’s pure electric range is less than 2 miles. An S6 variant is expected to arrive in due time. 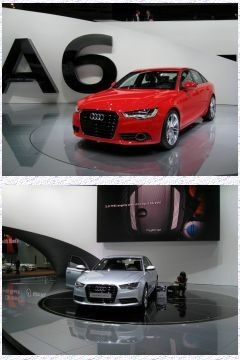 BTW, I decided to lead with the photo of the A6 Hybrid, not the red A6 because the shot of the hybrid has great 3D. Look at the archway behind the car and the Mercedes-Benz display beyond the arch. Also, notice the reflection of the Mercedes signs on the glossy floor of the arch. Click on the image gallery below to launch the Stereo Photo Viewer applet to view in optimal 3D (or 2D if you don’t have 3D glasses or a 3D display). This entry was posted in 2011 NAIAS, 3D Imagery, 3D Photos, Audi, Automakers, Ronnie Schreiber and tagged 2011 NAIAS, A6, Audi, Hybrid, NAIAS. Bookmark the permalink.